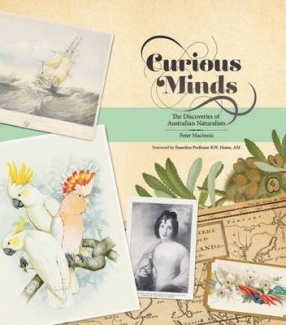 Curious Minds, by Peter Macinnis, is a lovely book. I stumbled across it when I was at the library picking up a book I’d reserved (Simone Lazaroo’s (2006) The Travel Writer) and I’ve been reading it on and off over the weekend. Australians often forget just how odd our flora and fauna seem to Europeans. That Wallace Line which defines the boundary between our fauna and what’s in the rest of the world was only recognised in 1859, but long before that travellers’ tales were full of strange rats, greyhounds that hopped (i.e. kangaroos), swans that were black in defiance of Aristotle*, and double-ended reptiles. Curious Minds is the story of the naturalists who came to our shores and began to identify and classify our strange animals. It’s fascinating reading. But even before Dampier, there was Willem de Vlamingh (1640-c1698) with his Dutch crew . They were searching for a ship lost at sea when they found themselves on an island they named Rottnest, (Rat Nest), in honour of the quokkas that they saw everywhere. These cute little creatures will scamper up to visitors in hope of a treat – and from what I’ve seen they get a completely different reaction to an approach by rats – but then maybe sailors at sea were more used to rats than we are today…The men and women who observed these curiosities were indefatigable. From the time of British Settlement, semi-professional and amateur naturalists gathered specimens, dissected them and sometimes (bravely) ate them. They preserved their specimens with varying degrees of success, and they did their best to take them back, dead or alive, to Europe. More in keeping with the way contemporary conservationists work, they also described them in painstaking (if sometimes inaccurate) detail, and drew or painted illustrations of them. The book is lavishly illustrated with full colour pictures from the National Library’s collection and some of the botanical paintings are so beautiful one might almost buy two copies of the book to cut out and frame them. More anxious than the rest, they had pestered me from the moment they dropped anchor to allow them to go ashore, and I had been obliged to give my permission in order to be rid of them I must say here in passing, that those captains who have scientists, or who may some day have them aboard their ships, must, upon departure, take a good supply of patience. I admit that although I have no lack of it, the scientists have frequently driven me to the end of my tether and forced me to retire testily to my room. I was very pleased to see that the contribution of women is acknowledged in this book. I had read about Georgiana Molloy (1805-1843) in The Complete Book of Heroic Australian Women but I had never heard of Amalie Dietrich (1821-1891). Molloy came to the Swan River Settlement with a ‘genteel love of gardens and plants’ but was worn out with childbearing and the drudgery of pioneer life when an amateur botanist called Captain James Mangles heard about her interest in plants and struck up a correspondence with her, asking her to collect specimens for him. She sent him remarkable new species, complete with viable seed and pressed specimens that were ‘far better than those sent in by professional botanists’. Tragically, she died aged only 38. Dietrich, on the other hand, was a professional collector. Although the biography written by her daughter is unreliable, Dietrich seems to have had training in collecting herbs from her husband, and when the marriage failed, she sailed for Australia to collect specimens for a private museum in Hamburg. She appears to have been undaunted by Australia’s most deadly species: she is thought to be the first European to capture a taipan, and may even have gutted a 6.7 metre crocodile. There are wasps named after her, and her collection of spiders formed the basis of the first study of Australian spiders. Our little Aussie platypus is one of the most intriguing animals on the planet, and the story of George Bennett (1804-1893) shows just how this elusive creature has fascinated scientists for so long. His quest to breed the platypus was never successful – and like many in this period he sent rare and valuable specimens back to England instead of retaining them for Australia’s fledgling museum – but still, he made a remarkable contribution. Curiously though, considering that Sir Joseph Banks is a Big Name in Botany,** his erroneous assumptions about the lush meadows of Botany Bay nearly cost the lives of the First Settlers in 1788. There were ‘no farmers, no naturalists, no botanists, and nobody who understood mining or geology’ in the First Fleet and since they arrived in the middle of Sydney’s scorching summer, they almost starved to death. It was up to the chief surgeon John White to accompany the governor Arthur Phillip when he went exploring, and he sent drawings, specimens and his journal back to England. Macinnis also tells us about the mystery of the so-called Watling Collection which consists of paintings which were the first scientific descriptions of several Australian species, including some such as the magpie goose which is now extinct in Sydney. Macinnis has an engaging chatty style, enriching his stories of these remarkable men and women with quotations from their journals and anecdotes about their lives. But it is no hagiography: he is alert to the temptations of pride and hubris, professional jealousy and dishonesty. There was occasional recklessness, unconcern for the safety of others, and single-minded selfishness. He acknowledges the improper appropriation of Aboriginal artefacts and remains ‘in the name of science’ and he recognises the limitations of those whose enthusiasm was not matched by preparedness or organisational skills. He is staunchly patriotic, devoting the latter part of his book to those naturalists who were either born here or settled here permanently and were the foundation of an Australian-based scientific community. These include Baron Ferdinand Von Mueller (1825-1896) who founded Melbourne’s own Botanic Gardens; Louisa Anne Meredith (1812-1895) whose exquisitely illustrated travel books chart the transformation of her opinions about the Australian bush from dismissive to enthusiastic; the Scott sisters, Harriet (1830-1907) and Helena (1832-1910) whose artwork, says Macinnes, has never been bettered; and Louisa Atkinson (1834-1872) who was lost to natural science through childbirth – her studies of birdlife are just gorgeous. It was a sign of mean-spiritedness to come, but today her collection is the pride and joy of the NLA. What shines through this lovely book is a sensitivity to the courage of people who set out for the unknown and to the curiosity that drove them to search for knowledge. Highly recommended as a gift book or as a science, art, or history resource for every secondary school library. Visit Peter Macinnis’s website to see more about Curious Minds. * Aristotle used the example of white swans as an irrefutable fact, i.e. because all swans were white, etc. ** One of our loveliest plants, the Banksia is named after him. Another book to add to our collection of indigenous materials at school! 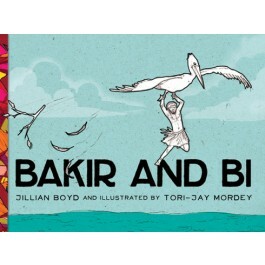 Bakir and Bi by Jillian Boyd and Tori-Jay Mordey, is a small-sized hardback picture book, a little bit smaller than A5. I mention the size because it so perfectly suits the intimate feel of this book, which is beautifully illustrated with line drawings, in sepia, teal, and black-and-white. Bakir (rock) and Mar (storm bird) live on a remote island called Egur with their two young children. While fishing on the beach Bakir comes across a very special pelican (Bakir’s totem is a pelican) named Bi. A famine occurs, and life on the island is no longer harmonious. 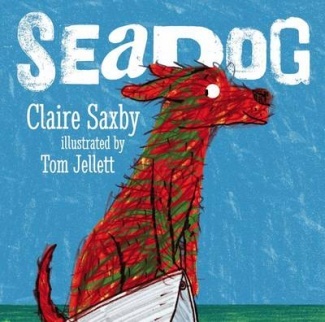 One day Bakir and Bi disappear and Mar and the children are forced to make the journey to another island by canoe … and so begins the adventure. Bakir and Bi is based on a Torres Strait Islander creation story, but aspects of it are rather dark, making it perhaps more suitable for older children. In the beginning island life is lush and food is plentiful, but when the famine strikes families turn against each other. The family has to hide Bi (their pelican) otherwise he would be eaten by the other islanders who are starving. Bakir has already warned his family that they may need to leave the island one day, but when it is time for Bi (the pelican) to leave because he has outgrown his hideout, Bakir disappears along with the bird, leaving his family to fend for themselves. They then have a perilous journey across the sea to a new island, and Lusik is almost lost at sea. When they finally reach safety, they are not reunited with Bakir: he has become a rock to guide and watch over them instead. I think that older children would enjoy discussing the supernatural elements of the story, but could also tease out the ideas behind Bakir following his destiny. They could also explore the Kedawar tribe’s belief that a person grows to become their name: the children could find out the meaning of their own names and decide whether their names suit their personality or achievements. (My own name means ‘devoted to God’ which is not particularly apt for a non-believer LOL!) And while the book shows people needing to find a new home because of famine, it could also be used to discuss the impact of global warming on island communities and what Australia’s role might be in offering a home to displaced communities as the water levels rise. Born and raised on Thursday Island in the Torres Straits, Jillian Boyd was the winner of the 2012 State Library of Queensland black&write! Indigenous Writing Fellowship. The illustrations by her niece, 18-year-old Tori-Jay Mordey are very impressive. This young artist has a rare talent, especially for depicting facial expressions and emotion, and the colour scheme is gorgeous. Visit ABC Splash for more ideas about getting indigenous voices into the classroom. We had always thought that this would be a fairly straightforward task, but now that I have read Kitty’s War by Janet Butler, I realise that there is much more to a war diary than first meets the eye. What’s not in a war diary can be just as interesting as what’s in it… and what’s in it, is sometimes not much about war at all, but rather about changes in identity because of the war. When Kitty McNaughton sailed away to do her bit as a nurse, she, like most of the other volunteers aboard, had never been out of Australia. The war (which everyone expected to be over soon) was an opportunity to see the world, and she devotes many pages to describing the journey. The troops and nurses were ferried to Egypt on the troopship Orsova, which was formerly a passenger liner. So this young woman enjoyed all the excitements that are common to cruise ships today: games and sports, fancy dress parties, a crossing-the-line ceremony, fancy dinners and so on. But there is no mention of any serious flirting because nursing was still cultivating a respectable image to counter Dickens’ Sarah Gamp. Kitty was always conscious that her diary was going to be read by others, especially her mother, and she is circumspect about what she writes. What’s also noticeable is that she doesn’t write much about the shocking injuries she encounters. Butler says that this is because Kitty feels constrained by her audience: these horribly mutilated young men often dying in dreadful pain were the husbands, sweethearts, brothers and sons of her friends and family back home. So, like others reporting to those at home both formally and informally, she maintains the conspiracy of silence about their suffering in order to protect them from the awful truth. It is when she is nursing German soldiers on the Somme that she finally feels able to write about the horror of what she witnessed, because they are Other, and she can describe their injuries and how their needs were addressed. Now when I first read this I recoiled at the idea that Kitty ‘enjoyed cutting into him’ – to me it felt as if she was enjoying a sort of vengeance against the enemy. But what Butler’s analysis reveals, from looking at the diary in its entirety and comparing it with a host of other documents and diaries, is that what Kitty is enjoying is being entrusted with the scalpel and being allowed to perform procedures that traditionally were the sole preserve of male doctors. To read Kitty’s self-effacing diary at face value without realising that it deliberately undercuts her own achievements is to overlook that Kitty was in fact a very good nurse indeed: she received commendations; she was mentioned in dispatches; she was in sole charge of the whole Bosches Line of German wounded (more than one huge ward of very serious cases); and she was allowed to undertake surgical procedures as well. What is also revealed by this rare documentation of the suffering of the German soldiers is that it offers Kitty emotional release. She describes her distress at the confronting injuries and the pitiable state of soldiers arriving with maggot-infested wounds, an outlet which is promptly closed when Allied soldiers arrive and she no longer gives herself permission to write about them. While close female friendships were nurturing and supportive, they could not salve the ongoing stress entirely. This is especially true when Kitty is transferred to a clearing station near the front line, where the nurses are carefully chosen for their suitability and monitored for signs of strain. Where the official histories make no mention of the fact that the nurses are much closer to danger, Kitty and other nurses write about it in detail. She has to undergo gas training before the transfer, and we know from the diaries of other nurses that their clothes stank afterwards of the gas. Kitty also records shelling, missiles falling into the camp and the crash-landing of two allied planes in the field beside it, but she does not record her own bravery, as for example when she is ordered to fall back because of an impending German attack and refuses to go. Yet there is a striking absence of any commentary about the sick and wounded, at a time when the casualty rate is shocking. Medical officers reporting to their professional journals provide information about the horrific situation that is omitted from Kitty’s diary, and the testimony of a Matron O’Dwyer confirms that nothing – not even experience at the base hospitals further back from the front line – could prepare nurses for what they were to encounter at a clearing station. 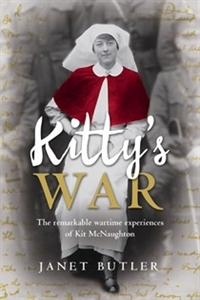 But Kitty’s experiences here are at war with the identity she has crafted for herself within this diary: as a tourist, a recorder of culture and a chronicler of the affairs of women, of family and of Anzac glory. (p. 181) In her four months at this clearing station, she does not know how to write about the relentless flood of seriously wounded men in pain. There is so much more that I could write about this brilliant book but I will confine myself to recommending that if you read just one book about the ANZAC experience, it should be this one. Butler’s humane analysis covers much more than just the experience of one woman at war, and the issues raised by this book have been the subject of many conversations with friends and family while I’ve been reading it. The book includes B&W photos of Kitty, comprehensive notes, a select bibliography and an index. The launch at the Melbourne Shrine of Remembrance was a slightly more sombre affair than other book launches I have been to. Held in the visitor’s centre, proceedings began with a recitation of the Ode of Remembrance, and the book was launched by Colonel Jan Mc Carthy ARRC (retd) from the army nursing service. Many of the people there were descendants of Kitty McNaughton who shared the author’s pride that the story of this remarkable young woman has been told at last. Highly recommended for teachers of Australian History, teachers teaching on the topic of War, and teachers teaching Gender Studies. Source: Review copy courtesy of UQP, and autographed on the night by the author! I’ve always rather liked the Catholic idea of sainthood. Not because I believe in miracles or any of the spiritual concepts associated with it, but because I like the idea of acknowledging people just for being good. Society rewards soldiering with military medals, and most countries have some sort of honours system for high achievers. There are bravery awards, and educational systems usually have some kind of award system for excellence in a variety of fields. But (as far as I know) only the Catholics confer sainthood on people for being good, and so it’s rather nice that Australia has got its very own saint at last. I teach in a secular school and so this is the approach that I would take in the matter of the canonisation of Mary MacKillop. She was a pioneer of education for all children rich and poor, and she was an inspiring female role model who set up her own school and founded her own order of nuns. This kind of leadership was not common for women in the 19th century and so her story in Meet Mary MacKillop helps to provide gender balance when teaching children about significant people in Australian history. Teachers who do even a rudimentary bit of research at Saint Mary MacKillop and at Wikipedia will soon see that Mary MacKillop was a spirited woman with a talent for controversy. As the timeline in the back of this book shows, she was excommunicated and even when this was rescinded and she had the Pope’s blessing for her new Order of Nuns, there was conflict with her superiors in Queensland. Wisely, Sally Murphy has skipped over all these complicated dramas, and told the simple story of MacKillop’s first foray into teaching in Penola South Australia in a beautiful hardback picture book. The full-colour illustrations by Sonia Martinez contribute to showing the pioneer lifestyle and the text focusses on MacKillop’s initiative, determination and devotion to her faith. Meet Mary MacKillop is one of a series being produced by Random House to resource the National History Curriculum. You can find out more about Mary MacKillop at Saint Mary MacKillop and at Wikipedia. Review copy courtesy of Random House.